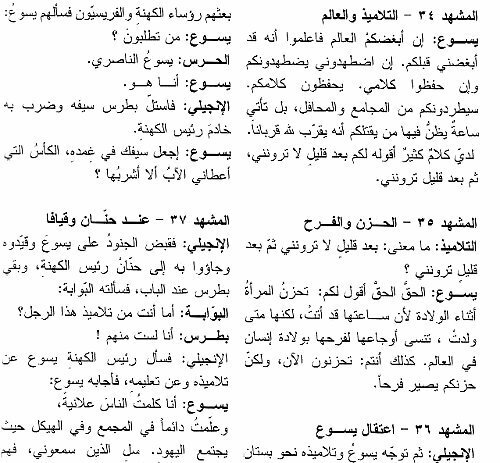 All of which makes the music media's neglect of a setting in Arabic of one of the treasures of Christendom, the Gospel of John, disappointing but predictable. And the disappointment becomes greater when the setting is revealed as by a composer whose influence has been acknowledged by none other than John Adams. 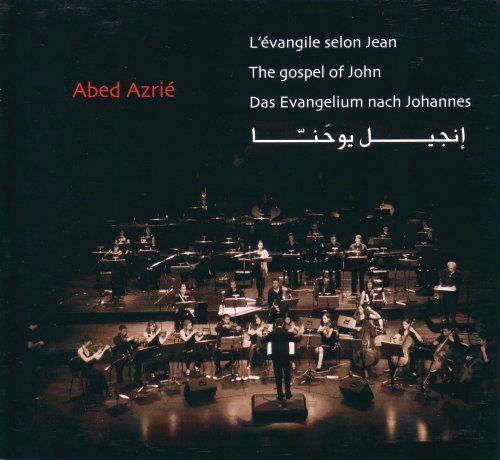 Syrian born composer Abed Azrié uses his own translation for his L'Évangile selon Jean (The Gospel of John). 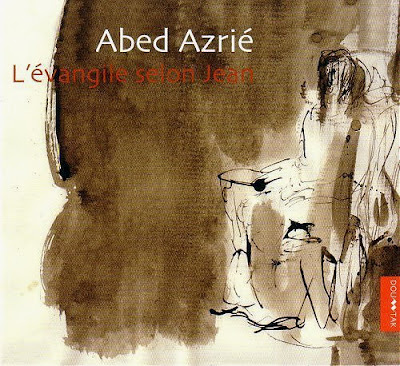 Abed Azrié has lived in Paris for more than thirty years and has released a succession of successful albums setting traditional and modern Arab texts to an updated style of Arab classical music that mixes ethnic instruments with synthesizers. His 1991 album Aromates was released by Nonesuch and John Adams has said that the Act 1 scene with Mamoud in The Death of Klinghoffer was influenced by Abed Azrié's music, which he was listening to while composing the scene. The subject of John Adams' opera, Leon Klinghoffer, was murdered on the cruise liner Achille Lauro by Palestinian terrorists off the coast of Syria. Abed Azrié is humanist rather than religious and he treats John's Gospel as a literary rather than sacred treasure. L'Évangile selon Jean is scored for soloists and mixed voices with the composer singing the role of Jesus, together with an ensemble of traditional Arab instruments and a Western chamber orchestra which includes an accordion. It has been performed in Damascus, in France and at the prestigous Festival of Sacred Music in Fes, Morocco and has just been released as a 2 CD set plus DVD on Abed Azrié's own label Doutak. Below is a visually beguiling image of the text from the CD booklet. When I came across L'Évangile selon Jean my initial reaction was scepticism, simply because so many musicians today are rolling out East meets West meets Islam meets Christianity projects with one eye on current political events and the other on the box office. But I quickly realised that L'Évangile selon Jean is different. It makes no religious or political statement other than that the Gospels are great works of literature; as indeed are the other revealed books of the monotheistic religions, the Qur'an and the Torah and the canonic texts of Hinduism and Buddhism. Over and above the two instrumental preludes there are forty four sung scenes, all short like miniatures, fragments of a far-off dream, a suite of episodes from life transcribed into music. Credit for the success of the project must be shared by all the musicians involved. These are the young French conductor Alain Joutard who directs the French based l'Orchestre des Jeunes de la Méditerranée (Youth Orchestra of the Mediterranean) and the traditional musicans, soloists and choir from Damascus. Some of the currently fashionable world orchestras for peace could do well to study the 2010 programmes (and playing) of l'Orchestre des Jeunes de la Méditerranée which include Maurice Ohana's oratorio Llanto por Ignacio Sanchez Mejias and Steve Reich's Drumming as well as Britten and Stravinsky. L'Évangile selon Jean is musique sans frontières par excellence as well as an invaluable celebration of the Arabic language and of the great oral tradition of the Arab world. But Abed Azrié's most remarkable achievement is that by declining to make any great statements he has made a very great statement indeed. Syria's record on freedom and human rights has failed to improve in the 10 years since President Bashar al-Assad came to power, according to Human Rights Watch. The agency delivered what it called a "bleak" verdict on Assad's record on political and human rights activity, freedom of expression, torture and the treatment of the country's Kurdish minority. Virtually nothing has been done in the last decade, the report concludes. ** L'Évangile selon Jean is released on Doutak (audio samples via that link) as a 2 CD set with a bonus DVD of a full length performance with English, French, German and Arabic subtitles. The slightly dry and close miced sound of the live recording from L'Opéra de Marseille used for the audio discs favours the voices but is more than acceptable. Strangely the DVD recording was made in a different location, the opera house in Damascus. I paid the price of a single full price CD (21 euros) for this wonderfully rewarding set in the Harmonia Mundi boutique in Nantes, France. Online prices are higher but should not deter those who refuse to let the mainstream media limit their musical horizons. Trivia - Syria banned the Disney hit The Lion King because the country's president was called Assad, which means lion in Arabic. Asad (one ess is a better spelling) certainly means lion in Arabic, but this is surely an urban myth. See for example this online catalogue of a DVD shop in Aleppo: http://dvdsyria.com/view.php?action=movie&id=1409. My experience in Damascus was that if a shop didn't have a title in stock, be it DVD, CD, software or game, they could get it by the morning, pirated of course. Perhaps Joris Luyendijk was referring to theatrical rather than DVD release? There is most certainly a wide divergence between officially approved media and that available on the pirated market in countries like Syria. But urban myth or not there can be no doubt that Syria has many problems in the areas of freedom of the press and human rights. But whatever the story on The Lion King thank you for responding to this post which does open up a number of interesting paths.